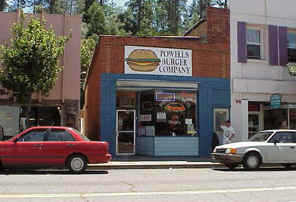 Powell's Burger Company claims to have the best burger in the foothills, and they may; but it stops right there. After a dusty ride to Placerville from the valley, I ordered my cheeseburger and fries and walked to the back of the restaurant to the bathroom to wash my hands. Before I could reach the door, Dr. Meat (who also has a comprehensive toilet web site called the Potty Guys) came staggering out of the hole gagging and wiping his eyes. I knew that if the "Nuclear Flatulator" could not survive the room where old buffalo go to die, I had no chance, so I licked my hands and headed over to an empty table with plastic chairs. When my elbows stuck to the table and my shirt and pants were glued to the chair, I knew that this was not going to be a good review. But I was very surprised when our food arrived. The one-third pound burger was hand pressed, fresh and seasoned to perfection. It was flame broiled and had a backyard, natural smoky flavor. This twenty napkin, elbow dripper was covered with two thick slices of melted cheddar and jack cheese. Atop that gooey mountain was a pile of chopped, fresh iceberg lettuce, sliced red onion, pickles, and mountain grown tomatoes. The sauce was a creamy mix of Dijon mustard, mayo and black pepper. It complimented the burger and condiments perfectly and had Dr. meat licking his plastic basket for any errant drops. The bun, however, was a stale but toasted sesame seeded Wonder type bun. At first grab, my fingers penetrated the bread and sunk into the meat. After two bites, the bun disintegrated, and I was left cupping a salad and hot patty in my dirty hands. It was very frustrating, and at one point, I started eating it with a fork. Shoving a quality piece of meat into a cheap, weak bun is almost criminal. The fries were another major disappointment. They were frozen white sticks, fried up into puffs of white steam. They were hot and salty but lacked any flavor and most of them were left on our table when we left. Powell's specializes in burgers. But in order for them to join the burger giants in Nor-Cal, they are going to have to expand their attention to the bun and fries. Being highly touted burger experts has a tremendous amount of responsibility. Readers demand we review every "podunk" burger place west of the Rockies for they believe that have the secret burger that we are searching for. For this review we thought we better let the hill people have their day in court, so to speak, since our last road trip was to the inner bowels of Sacramento. Destination: Placerville, Hangtown, the land where polydactylism is thought upon as cool, or P'ville as some dorks refer to it. At 444 Main street we pulled up to Powell's Burger Company. A quaint little diner that has the grill up front (I like this, I want to see how my food is being handled), window seats (I would suggest sitting there for reasons I'll highlight in a minute), and a room in the back with resin chairs and tables. My colleague and I sat in the back room to get away from the curious stares of the locals; they have never seen anybody in their 40's with all their teeth so we created quite a stir. We settled back and listened to the soothing sounds of Faith Brooks or some other "legend" of country music, when in a slow, methodical, stalking, powerful stench put a hurt on my nose like a jab from a professional boxer. The back room is clean enough, but it is too close to restrooms located down the hall. I hate to judge a restaurant by its bathroom, but the stench emanating from the men's room was not of this earth! The foul odor hanging in the air like a San Francisco fog had to be toxic, or the restroom is a combination meat rendering plant and medical waste dump. I just couldn't go back there and look. Besides our food was brought to our table in less than 10 minutes, and once I laid eyes on this monster all fears of loss of appetite were erased. This was a big burger. It came with a very tasty char-broiled patty, cooked with an expertise that rivals some of the best chefs in Europe. Two slices of melted cheddar and jack cheese, crispy garden fresh vegetables (the tomatoes tasted like they were right off the vine), and a secret Dijon mustard sauce with a precise amount of pepper that left me craving for more. That is until I picked up this beast and my thumb punctured the bun. This bun was a semi-stale Wonder (sponge tasting dryer lint in texture) bun. Thankfully the cooks charred it a bit to make it a little more palatable. I will never understand why a cook will go to all the trouble of perfecting a sauce, cooking with precision, and then slap the whole thing on a bun from the local food coop out of the day old bin! This burger EARNED 45/50 points and then died with a 10/25 for the bun (a gift in my estimation), combine this with an 11/25 for their lousy frozen grease sticks, and you get 66/100. I have two suggestions for the people at Powell's for their unfinished symphony: 1. Call Munzio bakery and get a real bun It may cost a little more but it will be worth it in long run. 2. Stop allowing all the campers to dump their "brown and gray water" in your men's room (in other words find the smell and kill it), the small amount of profit made from this venture could be made up with a more tactful money maker like a jukebox.